Smartphones are a way to stay connected to work, friends and family. However, for those who have trouble seeing, smartphones and tablets are revolutionizing their lives. With the touch of a button, someone who is blind suddenly has eyes. Hans Jorgen Wiberg is the inventor of Be My Eyes, a free app developed in Copenhagen that links a blind or visually impaired person with a sighted volunteer who then has access to a live camera feed. It’s just one of the many advances in technology that help those who can’t see be more independent. When the Be My Eyes app is first launched it asks: “What is your role?” The user can then choose: “I am blind” or “I am sighted. 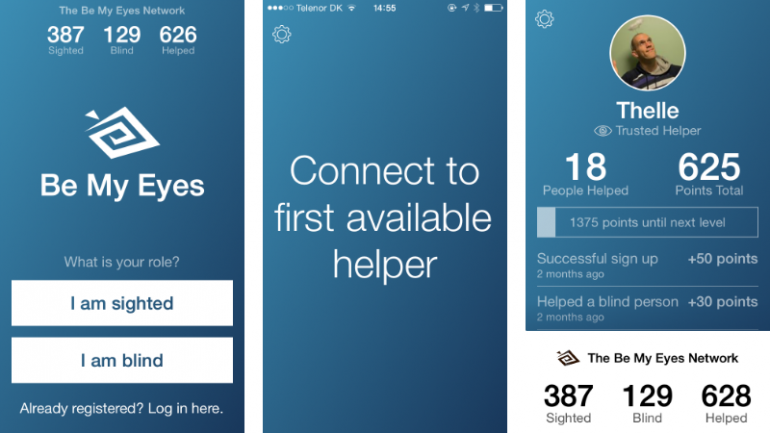 If the user is blind, “The helpers in the Be My Eyes network are volunteers who can read out information for the user. The project has currently received $300,000 (£197,000) for development and more development may be needed as it presently only works on Apple’s iPhone. Be My Eyes’ launched two and a half weeks ago. So far, more than 8,000 blind people have signed up and 102,000 thousand sighted volunteers. This new technology has been built within apps to help the visually impaired and currently available on iOS. Here at Pocket App we have years of experience developing mHealth solutions for clients and would be happy to expand these type of apps on all platforms to reach a larger target audience.